PACER provides information, resources, and technical assistance to parents of young adults, 14 through 21, with disabilities and the professionals who work with them on transition related topics, such as; post secondary options, housing, employment, and recreation. Housing: Where Will Our Children Live When They Grow Up? Parents of youth with disabilities will find that this easy-to-use book answers many questions about future housing choices to make with their child. 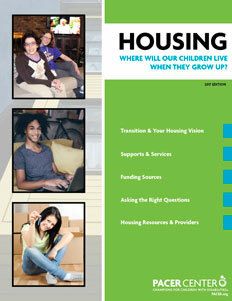 From housing options to funding to supports and services, there is a wealth of information. Updated 2017. What parents can do to help plan for their child’s transition from high school to adult employment, postsecondary education or training, and independent living. 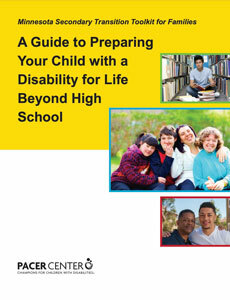 Includes talking points to help plan with your child for his or her future and a resource list. Updated 2016. This toolkit was created to make transition planning easier and offers easy-to-understand information about the purpose of transition planning, the goal and importance of age-appropriate assessments, and the required rules that are used by schools. It also includes information on the community partners that can provide youth with supports as adults. Topics include healthcare and health maintenance, benefits planning, postsecondary education and accommodations, recreation, social resources, transportation, and housing. 2017. One copy may be printed from downloaded booklet. This booklet lists free and low-cost mobile apps that are available to support transition-age youth with disabilities as they embark on their journey towards post-secondary education, job training, employment, and independent living. Free to download. 2017. Articles show how the Americans with Disabilities Act affects child care centers, recreation programs, schools, filing complaints, health care providers, post-secondary education and the Rehabilitation Act, employment discrimination, and transition. 1993-1997. How Can I Help My Son or Daughter Get That Job? The goal of this training is to help families, caregivers, and professionals understand the realities of today’s work world so they can help youth with disabilities earn competitive employment. Participants will learn the importance of disability self-awareness, how families can help youth with career planning, and strategies to navigate resumes, job interviews, and job accommodations. Download only. This training provides answers to common questions PACER receives from parents and advocates related to Social Security Benefits for individuals with disabilities in a way that is understandable to someone unfamiliar with the system. It also highlights federal and state training programs and Social Security Work Incentives that can help transition-age youth reach their educational and work goals while receiving SSI benefits. 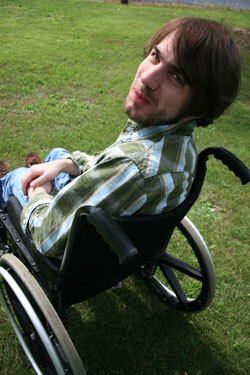 The curriculum can be used by organizations or individuals offering workshops or trainings to parents of youth with disabilities in middle school or high school. Download only. PACER has partnered with a number of national technical assistance centers to develop content designed to inform youth and families about a range of transition topics, such as postsecondary education, mental health, career development, soft skills, disclosure, diploma options, transition planning and more. View the full list of these collaborative products. An innovative and engaging board game that helps youth and young adults plan for life after high school. Players draw cards with questions related to careers, independent living, and self determination. Six game pieces included. 2010. Laminated cards with questions to ask during your child's Individualized Education Program (IEP) meeting about the transition planning process. 2018.